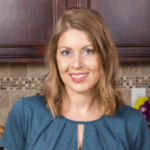 Published: Aug 23, 2018 · Modified: Apr 11, 2019 · By Jen Sobjack · This post may contain affiliate links. This post has been updated with new content and photos. The original post was first published September 24, 2014. These cookies are simple and completely irresistible, just like my chewy coconut cookies. 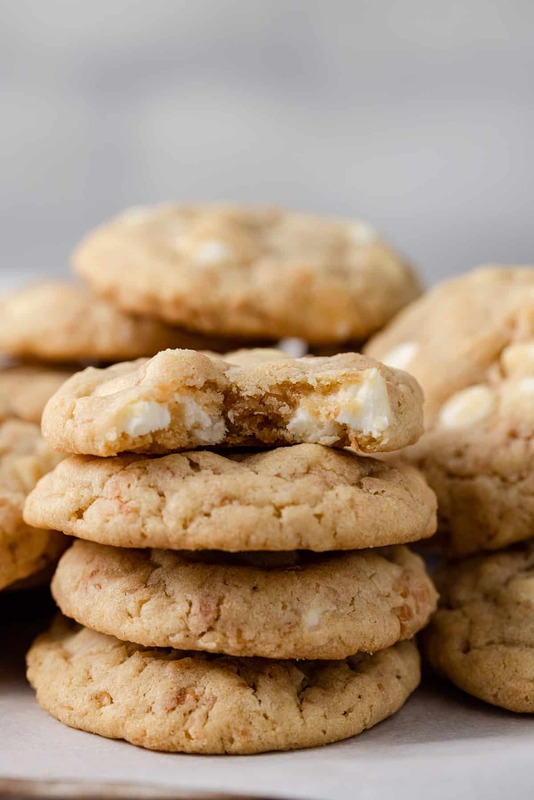 The toasted coconut turned out to be the perfect complement to the sweet white chocolate chips. These cookies are adapted with my most favorite chocolate chip cookie recipe. I made a few changes to the batter and I absolutely love the result. It’s the perfect texture. Soft and chewy on the inside with a slight crunch on the outside. Toasting the coconut enhances the flavor and gives it a crunchy texture. The crunchy, soft, and chewy texture of these cookies is phenomenal. The white chocolate chips become melty, the toasted coconut is crunchy, and the sweet dough that surrounds it all is soft and chewy. This is one tasty cookie! 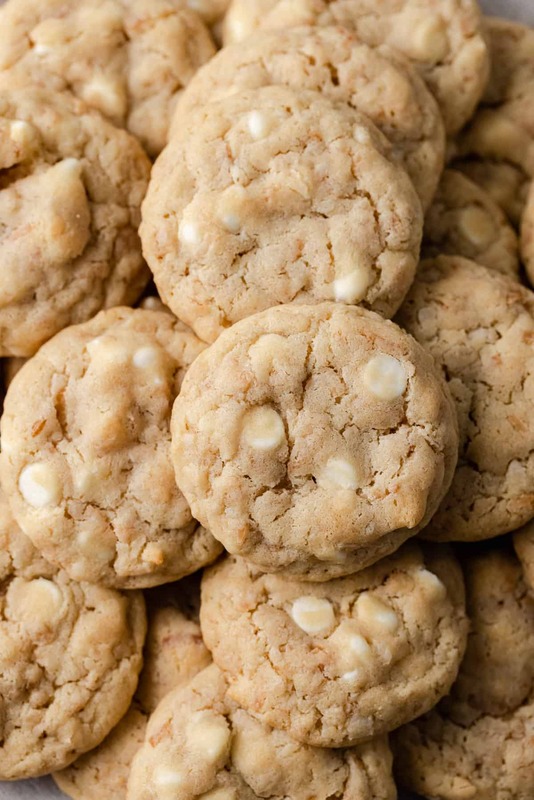 How to toast coconut for white chocolate chips cookies? I have a full post on three different ways to toast coconut. You can do it on the stovetop, in the microwave, or in the oven. You decide which way is best for you. Just make sure the coconut has cooled completely before adding it to the cookie dough! 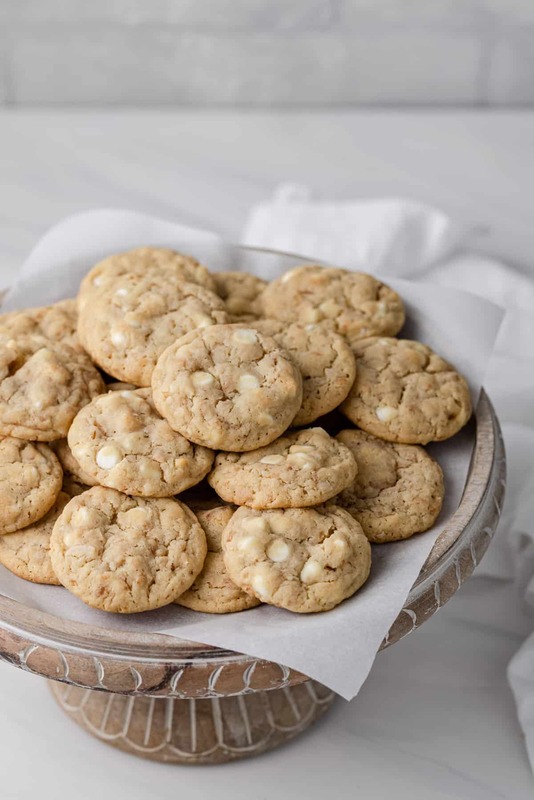 How to make white chocolate chip cookies with toasted coconut? Combine the wet ingredients and the dry ingredients separately then mix the two together. Mix until the dry ingredients are almost fully mixed in. Add the toasted coconut and white chocolate chips then gently fold everything together with a silicone spatula. Shape the dough into balls and place them on a baking sheet. Bake the cookies just until the edges are set and begin to turn light brown but the center of the cookie looks soft. This will give you the chewiest texture once they’ve cooled. Don’t want to roll the cookies? No problem. Simply use a 1-1.5 tablespoon-sized cookie scoop and plop the dough right onto the baking sheet. Preheat the oven to 350ºF degrees. Line 2 baking sheets with parchment paper; set aside. In a medium-size bowl, combine the flour, baking soda, cornstarch, and salt; stir with a whisk. Beat the butter and both sugars together in a large bowl using a stand mixer with a paddle attachment or a hand-held mixer on low speed just until combined. Beat in the egg, egg yolk, and vanilla. Add the flour mixture all at once and stir until just combined. Fold in the toasted coconut and white chocolate chips. Roll cookie dough into 1 and 1/2 to 2 tablespoon sized balls and place them 2 inches apart on the prepared baking sheet. Bake the cookies for 8-10 minutes or until lightly brown and just underdone. Cool the cookies on the pan for 10 minutes. Remove from the pan and cool completely on a wire rack. The cookies will keep for up to 1 week stored at room temperature in an airtight container. Freeze baked cookies for up to 3 months. Thaw in the refrigerator overnight. Freeze unbaked cookie dough balls for up to 3 months. Bring to room temperature and bake as directed. *You can toast the coconut 1 of 3 ways. Read through my tutorial on how to toast coconut. I used a 1.5 tablespoon-size scoop and was able to get 26 cookies. Double check how you are measuring the flour. If you scoop it out with the measuring cup it will compact and you’ll have too much which will cause the batter to be crumbly. Hi, can i skip coconut in this and follow the same exact recipe to make white choco chip cookie.please reply soon. Hi! These look great. I have a question: How do you take your flour? Straight from the jar or spoon and leveled? Thanks. Hi Ashley! I always weigh my flour but if you don’t have a scale, it’s best to spoon and level. You can bake them straight from the freezer but you may need to add a couple extra minutes to the cooking time. Hello! These are my new favorite coconut cookie recipe! Thank you! Can you make ahead and store in the fridge or freezer? Yes! They should be fine in the refrigerator for a couple weeks and in the freezer for up to 3 months. These cookies were a big hit with my family, they are so good! I baked immediately after making, just rolled in balls and smashed them down thick and they stayed thick. Baked for 10 minutes and let sit in the oven for two more. Perfect and fast for those that can’t wait. HA! Thanks for the recipe, we love it! I made these and love the toasted coconut with vanilla chips.I always cut back the sugar in my chocolate chip (cc) cookies and could/should have done so with these too. Next time I will try 2/3 C. total sugar (1/3 C of each type).Thanks for the yummy recipe! Is the parchment paper or silicone mat required? Interested in making these, but not sure what the purpose of parchment paper or a silicone mat is, as usually for cookies I just place it right on the cookie sheet. It’s completely up to you how you want to bake the cookies. I like to use parchment paper or a silicone mat as extra protection against sticking, burning, and spreading. I made them yesterday and they are SINFULLY delicious..Keepers..Thank you! I’m so glad you enjoyed them! They are a real treat! I love love love using coconut in my cookies! Just reading your description has got my mouth watering…especially in February when a tropical getaway is soooo needed. Macadamia nuts can be sometimes tough to find (and pricey) so I love your alternative. What a lightbulb moment and you saved a trip out to boot! PINNED! Thanks for the recipe Jen! These were so good! A tad sweet though but still amazing! So glad you enjoyed the recipe, Shirley! YUM!! My Mom declared these the best cookies she has ever had!! I followed the recipe exactly, except I ran out of brown sugar, so I mixed half a cup of granulated sugar and 1/2 tbsp. of molasses. I will definitely be making these again! I am freezing the leftover dough for when we get another craving! I’m so happy to hear that you tried the recipe, Katelyn! It’s definitely a great cookie! Thank you so much for the positive feedback! Is the butter suppose to be room temp or melted? I used room temperature butter in this recipe. Sounds amazing. I don’t have any white chips, think it’ll be good with regular chocolate chips? Chocolate and coconut are great together, so if you like regular chocolate chips then it should be fine. Enjoy! Thanks for your response. I’d still like to try them with white chocolate chips, but they were delicious with regular chocolate chips too! That’s wonderful to hear! So happy you enjoyed them! 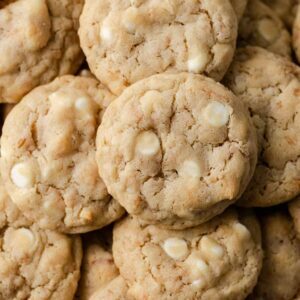 I’m a white chocolate fiend, and it sounds amazing with toasted coconut! I love the two together, so this cookie obviously sounds majorly delicious!! Yum! I love coconut and white chocolate so this sounds like a killer combination! Always looking for new cookie recipes to try and this one is definitely going on my list! Awe. Thanks for the pin Kelly! It was very tempting to each them all. I had to send them to work with the Mr. just to get them out of the house. I’m so glad you ran out of Macadamia Nuts! These cookies are amazing. LOVE anything with coconut! Thanks, Julie! Me too! I am guilty of eating flaked coconut straight from the bag. You had me at toasted coconut! Yumm! So glad you like it, Manali. Thank you! Oh my gosh toasted coconut. I’d eat the whole batch! Pinned! Loving the toasted coconut! Never thought to put it toasted in a cookie! YUM! Oh, it was so good in the cookies! You’d love it! Thanks Gayle! They were pretty spectacular!